1. Clinique Sonic System Purifying Cleansing Brush – I’ve been looking at purchasing a L’Oréal Clarisonic as I’ve heard nothing but positive reviews. However, it’s really out of my price range. But now Clinique have their own version and it’s cheaper. I wonder if it’s just as good? 2. H&M skirt – I love patterned pencil skirts, and this one is calling for me to buy it. 3. Paperchase – I need a notebook for jotting down ideas for work and the blog. And you might have gathered by now I love foxes. 4. Happy Handmade Home book – I’m a big fan of the A Beautiful Mess ladies and I think this book would provided me with lots of DIY inspiration. I sometimes get asked if I actually purchase anything off my wish lists. While I may live on a strict budget, from time to time I do treat myself. If you take a look back to last month’s wish list (September) I did actually purchase the black satchel (item 4) but ended up taking it back as it just wasn’t right. In the end I purchased a bag that looked similar to item 5, but so much nicer! I’ve used both the L’Oréal and Clinique cleansing brushes. I personally saw no difference between the two. The skirt looks like a heavy material per it’s picture, that seems perfect for fall! I hope you’re able to treat yourself to something on the list from this month as well. Thanks for the feedback! I’m glad that they both work well as the Clinique one is a hell of a lot cheaper! I really like your wish-list items. Looking foward to see them back on your blog 😉 I’ve been dying to get something like the Clinique Sonic System as well. 😉 I found last time a facial cleansing brush for about €1,50, you have to do it with the hand and I still need to try it out, so I hope it works fine! Saves a lot of money, haha. I’m currently just using a cleansing lotion with cotton wool pads and occasionally a cleansing face mask, but I’d love something that would be able to get really deep into the pores. Apparently they are life changing, haha!! 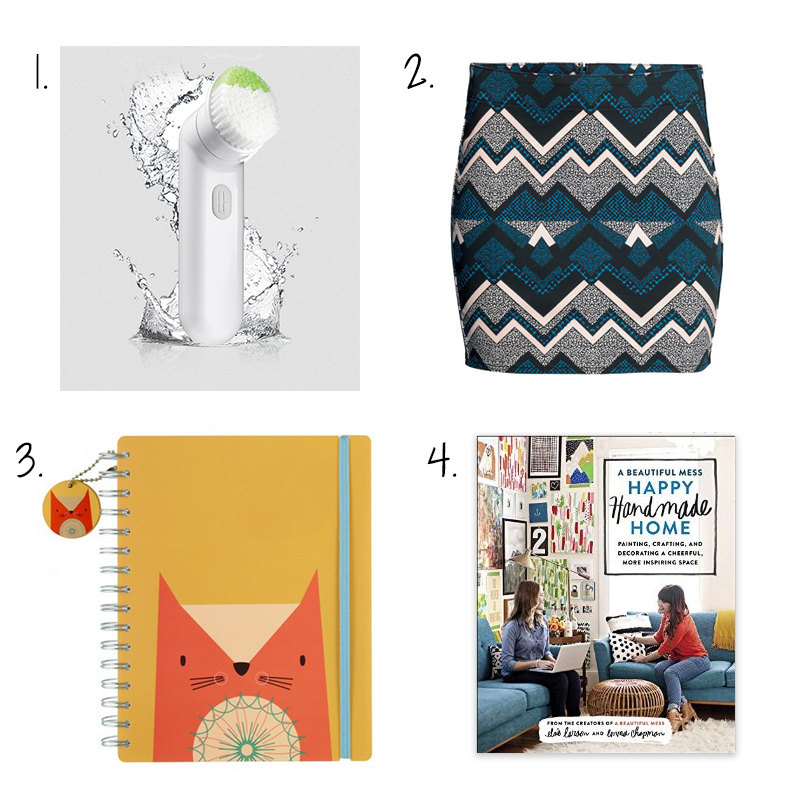 Hopefully you will get some of these goodies from your wishlist :D. The Paperchase notebook looks really cute! It would be great to have your blogging ideas to be written and organized somewhere so it doesn’t get forgotten. I have an el-cheapo little loose leaf pocket notebook paper that I keep all of my ideas on. It works wonder! It’s great to treat yourself once in a while :D.
I’ve never heard of a cleaning brush before… I actually have no idea what they do. I’m not sure what that says about my personal hygiene, heh. A Beautiful Mess is amazing – I’d love to get my hands on one of their books but haven’t really ever gotten around to it. Patterned pencil skirts are the best, though – I have a few and they’re my favourite thing to wear. I haven’t really thought about what would be on my wishlist at the moment. There are a few magazines I’ve got my eye on (print media is love and life), and I’d really like a couple more blank moleskines so I can journal more stuff. The cleansing brush just gives your skin a really deep clean and removed all the dirt from the pores. I’d love a Moleskine. I have a slight obsession with notebooks! LOVE that H&M skirt – did you get it? Please tell me you got it! Haha I’m totally obsessed with Paperchase -I want everything from that shop!